Remember taking tests back in elementary school when your teacher told you to always check your answers before turning it in? Same for an e-learning course. Before you deliver a course to learners, you want to look over your course to make sure it’s the very best it can be. But when you’re reviewing your course, what should you look out for? 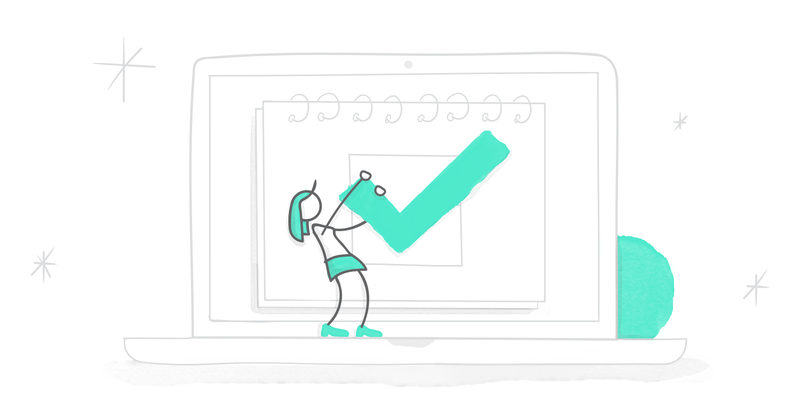 Every e-learning project is different, so no one checklist will work for everyone; however, here are some of the main things you’ll want to watch out for in your review. Are the learning objectives measurable? Does all the content support the learning objectives? Is there any content that could be taken out? Have all the facts been checked and referenced appropriately? Does the course follow a logical order? Do the images accurately represent the course material? Do the examples and/or scenarios accurately portray the real-life context? Will the learners find the characters relatable? Does the quiz focus on the course objectives? Are the quiz questions clearly stated? Are all the quiz options believable (even the wrong answers)? Do you clearly state what learners need to do to pass the course? Are there any grammatical or spelling errors? Are you using punctuation and capitalization appropriately? Are there any run-on sentences that you could split up into shorter, more concise sentences? Are you using the active voice? Can you replace any adverbs (for example, running rapidly) with more precise verbs (for example, sprinting)? Are there any superlatives like "high-quality" or "excellence" that you could take out? Is there any jargon you should take out or explain? Is the voice-over script written in a conversational tone? Does the voice-over script provide notes to the voice talent on pronunciation? Is the audio used meaningfully? Or is the narrator just reading the on-screen text to learners? Does the voice-over follow the script word for word? If not, do any of the slight changes make a difference? If not, edit the script to match the audio. If there are changes that affect the meaning, ask the person to re-record that section. Are there any distracting background noises that need to be taken out? Is the audio volume at a good level (not too loud, nor too soft)? Is the volume and quality consistent throughout the course? Does the tone and inflection sound natural? Never worked with audio before? This article will help you get started: Audio Basics for Online Course Design. Does the design respect the brand guidelines (if applicable)? Does the design complement the subject matter? Is the design cohesive throughout the course? Are the objects aligned as they should be? Are all the images of similar style and quality? Are images and illustrations meaningful? Or are they merely decorative? Are fonts used consistently throughout (type and size)? Are all screenshots free of personal information? Do all buttons and hyperlinks look and behave the same (for example, if one button has a hover state, do they all?) so learners understand they’re clickable? Make sure there’s no Previous button on the first slide. Go through the course from start to finish, click on all the Next buttons. Make sure there’s no Next button on the last slide. Go backward through the course, clicking on all the Previous buttons. Now go through the course again, starting from the beginning. Click on any other buttons (that open a layer, for example) or hyperlinks and make sure they’re working as expected. Can you access all the sections of your course from the menu? Are all the titles correct? Is everything in the right order? Is there a seekbar on all slides with audio or video? Does the seekbar end at the end of the audio or video? Or does it extend far beyond it? If your course has audio, did you include an audio button so learners can turn the audio off or adjust the volume? Are the animations synchronized with the audio (if applicable)? Do all the animations appear and disappear as expected? Does the video play all the way through? Is the audio high quality? Go through the quiz, making sure to select the correct answers and review the feedback. Make sure the score correctly shows you’ve gotten 100% at the end and that the correct amount of points is shown (if applicable). Go through the quiz again, this time selecting the incorrect answers and reviewing the feedback. Make sure the score correctly shows you’ve gotten 0% at the end and that the correct amount of points is shown (if applicable). Go through the quiz a third time. Alternate right and wrong answers. Check the score again and make sure it’s correct. Go through the quiz a final time, alternating right and wrong answers again but in the opposite order as the time before. Make sure the score is reporting correctly. Note that if you’re using a tool like Rise, you can skip this part of the review since all the functionality is prebuilt and it works perfectly every time. Was the course helpful and relevant to your job? What are the three most relevant things you learned? How confident are you that you can apply the new skill(s) you learned on the job? Is there anything you didn’t understand? Do you think the quiz accurately assessed your understanding of the course materials? Were the questions too easy, too hard, or just right? Was the feedback too detailed, not detailed enough, or just right? Were the navigational instructions provided explicit enough? Did you always know where to click, or did you sometimes feel lost and unsure where to click? Armed with this checklist, you can deliver your course to learners knowing you did everything you could to make sure it fits their needs, works properly, and looks professional. Remember: if it’s not perfect (and no course ever is) you can always go back and make changes later on, after you get learner feedback. What do you think of this checklist? Is there anything on your review checklist that I missed? If so, please share in the comments section below! And don’t forget to follow us on Twitter and come back to E-Learning Heroes regularly for more helpful advice on everything related to e-learning. Thank you for putting this together, Allison! It's incredibly helpful! What about checking different browsers? We are having a lot of trouble with users on Internet Explorer. Great list! It's so important to remember the little details - having previous and next buttons where they don't belong can cause a lot of unnecessary confusion for learners. So helpful! I was wondering what all to do to quality check our course! You might want to add a #6 to "Buttons and Hyperlinks" - same as #5, but going backward to check "Other", like learners sometimes do when they want to review. Thanks Allison, this is a great list! Thanks Allison. Any way you have these lists in a PDF or Word format ? Hi Allison, I would like to convert this into a form so that my quality reviewers can easily check off if something is missing. I would like to give you the credit in the reference. Do you have any preferences on how I go about doing that?